A Primer On Constructivist Teaching From the Karate Kid | Gary G. Abud, Jr. This entry was posted in Education Pedagogy Teaching on August 15, 2011 by Gary G Abud Jr. The unforgettable 1984 film, The Karate Kid, though pretentiously remade in 2010 with Jackie Chan, taught us many lessons about overcoming the odds, determination, and the consequences of martial arts karma, to name a few; however, one of the most subtle yet pertinent lessons from this film, in my estimation, had to do with teaching & learning. Do you remember Mr. Miyagi? No one could argue that he caused young Danny LaRusso much consternation as a teacher. Some might even have argued whether Miyagi was much of a teacher in the first place, especially Daniel-san at parts in the film, but those who know the plot can recall how Miyagi’s teaching resolved in Danny LaRusso’s learning. For those of you who might need a refresher, LaRusso gets heavily picked on, pushed around, and beat up by some school bullies (what we would today call assault, battery, and severe harassment.) He approaches Miyagi to teach him karate so he can defend himself and take on future bullying/fighting situations. Danny expects Miyagi to run him through kicking & punching drills (like Jillian Michaels on Biggest Loser) until he is a lean-mean-fightin’-machine; however, much to Daniel-san’s chagrin, Miyagi has him wax cars, paint the fence, sand the deck, and other menial tasks that seemingly have NOTHING to do with learning karate. When LaRusso finally gets fed up with Miyagi’s ostensible avoidance of a karate lesson, especially after all of Danny’s free labor, Miyagi engages Daniel-san in a confrontational situation where “wax-on; wax-off” becomes the greatest lesson never taught in karate! Danny enters into his karate “classes” eager just to have the ability to lay the smack down on his bullies. He was anticipating, and even expecting, Miyagi to employ direct instruction of a behaviorist educational philosophy, e.g., do exactly what the teacher says and mimic their every move. Miyagi’s teaching turned out to be the antithesis of that; it didn’t really even seem like teaching at first. Eventually, and only after he basically turned into a teapot and steamed-over with frustration, Daniel-san learned that Miyagi had been teaching him the entire time. Daniel-san did have to put the pieces together for himself, but as he soon as he did, he found out that a student-centered approach to teaching can lead to some very meaningful learning. Miyagi was clearly a constructivist when it came to teaching and learning. He thought, much like Dwight Schrute of The Office, that “experience is the best teacher,” and Miyagi sought to give Daniel-son a lot of experience that he could use to construct his understanding of karate. Some guided practice did follow all the manual labor, but not before there was some serious discovery learning in store for young Danny. In the end, Miyagi turned out to be quite the teacher. No one who has seen the film would argue that he accomplished his performance learning objective with his student. 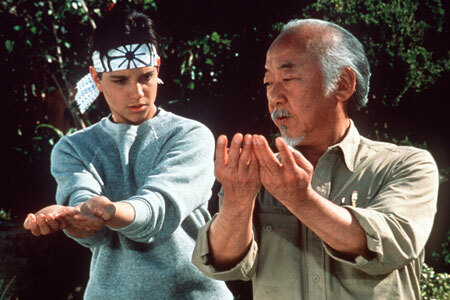 Despite his unconventional pedagogy, Mr. Miyagi teaches Daniel-san karate and much more. The frustration that LaRusso went through in the learning process with Mr. Miyagi was most likely cognitive dissonance regarding the way he thought karate should be taught and the situation in which he found himself (waxing cars, etc.) All in all, the learning experience Danny encountered led him to understand karate very well, to win the All Valley Karate Tournament, and pummel his nemesis. Would this all have been possible had Miyagi approached teaching any other way? What if they had gotten right to the business of drill & practice and avoided all the other preceding learning experiences? Surely, the cars would not be as shiny, but would Daniel have learned as much about karate as he did? Teaching comes in all kinds of different variations, but the most critical of all the lessons that can be taken away from this light-hearted martial arts drama is the educational philosophy of Mr. Miyagi. He could easily have let up on Daniel’s chores when push first came to shove, but he stood his ground and ended up teaching Daniel-san more than anyone expected. It may not have always made sense or looked like teaching to Daniel, because of the lack of traditional instructional methods; but bottom line: Miyagi was teaching the entire time, and it was solid teaching.